Building Surveyor – checking House Building Condo quality. 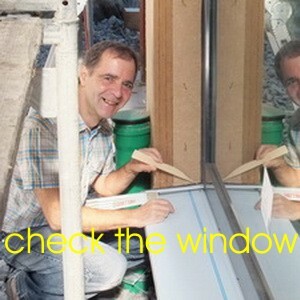 You get help from home inspector kd.schmalfuss@gmail.com German civil engineer. I offer International Building Surveying in Munich Stuttgart Nürnberg, etc. We attend you in German, English, Spanish and Russian for your home inspection. You can read about my scope of work here: checklist-for-investigation-and-checking-house-building-condo-quality. We can carry out pre-settlement inspection before you agree to buy. Better check condo before signing the contract! Watch here some video about my work as home inspector and civil engineer. c) Operating costs too high, (no) use of combination with solar technology to reduce electricity costs. Typical construction defects when buying the apartment in Cebu, etc. Philippines. For the examination of the legal norms before purchase we recommend the colleagues from Pattaya. Building control surveyor. I am a structural engineer with fixed prices. 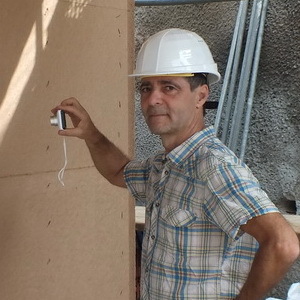 We check the construction quality of houses according to DIN EN ISO Standard, checking house building condo quality In MANILA, Pattaya and Phuket by Mr. Schmalfuss, German diplom Engineer. Building surveyor check houses building quality in Switzerland real-estate-due-diligence: working in the metropols: Munich, Zurich, Zürichsee (shore gold, gold coast golden beach) Bern, Basel and Luzern. The real estate appraiser is your expert to estimate the value of your dream home. 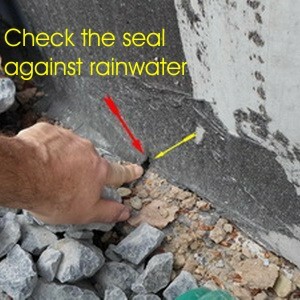 You want security about construction defects, such as mold. Leaky basement walls might have cracks when buying a house. You need a professional to advise you when buying a house! Don´t worry about unexpected expenses! We consult you offering fixed prices including a checklist and rating + travel expenses. When buying a house buyers are afraid of cracks in the wall. Cracks are continuously: by external influences such as vibrations from vehicles and construction activity. Even at high temperatures, cracks are expanding further. 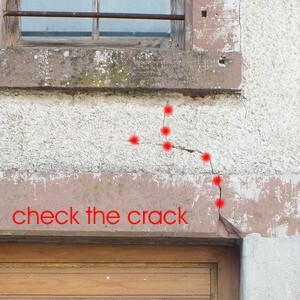 Cracks are not always dangerous for the supporting substance of the building or its stability. Cracks with low crack widths are sometimes insignificant for stability. Settlement cracks at a 45-degree angle are indeed dangerous. For cracks smaller than 0.5 mm a little painting and spatulas will do. Still, cracks might come back again. In order to eliminate larger settlement cracks you need to calculate higher costs for a surveyor. Often the foundation must be improved which will lead to high construction costs. Get a home inspection by a building expert, also specialized in mould! Mold on the wall is removed with 3% hydrogen peroxide (from hairdressers or pharmacies). 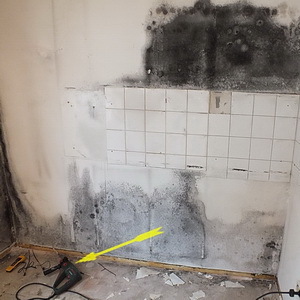 The cost of the removal of mold on the wall is moderate. Mold in the air is removed by ozone, or chlorine gas (MMS). One of the biggest problems is toxic mold in the Aircon. Air conditioners should be cleaned every 2 months from black mold. The cost for the removal of mold in the air are low. Mold in the insulation of the floor is removed by getting rid of and replacing the screed and insulation. This causes high construction costs. Your mold surveyor can inform you about the costs for removing mold in homes and prevents possible causes. The “biggest enemy of the building fabric” is water. When water enters your building either being rain or flood water salt formations are going to appear soon on the walls. Damp spots will also appear on the wallpaper. I therefore check for proper sealing. My experience as a building surveyor for water damage showed me that the cost of removing the effects of water damage are often very high because the floor generally must be ripped out. Often the insurance company doesn´t pay for the necessary change of the flooring. My customers usually don´t know that the insulation can become moldy in the floor. But there is organic material which becomes moldy quickly (within 5 days) in combination with moisture. Pumping out the water and disinfecting is not sufficient. Water shouldn´t come through the frame of closed windows. Therefore windows must be tight against the wind (wind proof) and sealed against rain (rain proof). The evaluation of the claims as a reviewer for windows shows that the cost for sealing existing windows are often relatively low. Windows can be sealed with simple means. 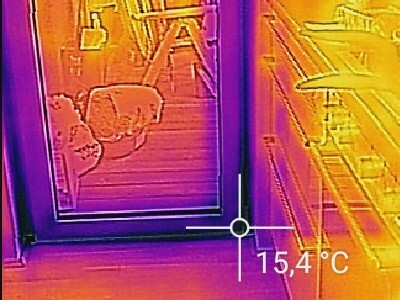 As a supervisor of COSTRUCTION DEFECTS I often dectect hidden defects of heat losses, such as leaky windows.This will save you from high operating costs. Most people are sensitive against noise. Our need for rest is important. In many ads for house purchase the quiet location is highlighted. Stairs should be sound-proof. 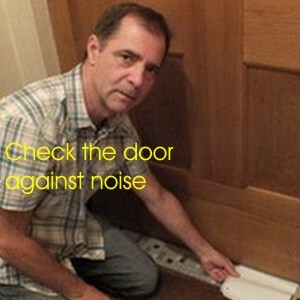 I also check whether the sealing of the door is sealed against noise. This seal is also relevant in case of fires. bridge (noisy) from laminate flooring to ceilings & floors, when you are walking. In reports for noise protection and neighborhood noise the costs to decrease noise are often very high because usually the bearing end components must be subsequently isolated. See for example : a crashed mitsubishi mr. slim on youtube which crashed after 10 years. This is very noisy and loud (loudness). Why I make this page about building control surveyors prices? The wish to find a reliable expert in the process of acquiring a house is very common. See e.g. forum find-a-building-surveyor and here building surveyors check houses building quality (farang) foreigner built. Foreigners are unsure to buy houses abroad. Being a German engineer, specialiced in mold I can give you proper advice. The rules of the art, such as how houses are built are essentially always the same: We need to calculate the safety from a storm. 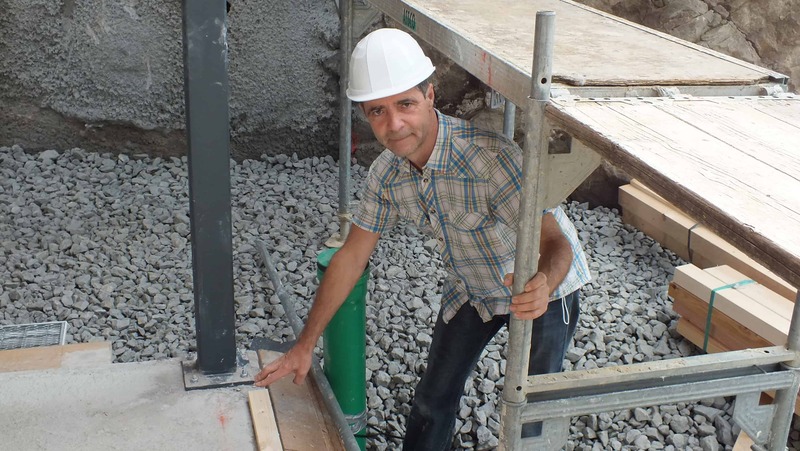 You get help from German civil engineer, also experienced in International Building Surveyoring. I do not currently have a commercial application in the Philippines, but I do have one in Germany! Because of the double taxation agreement between Germany and the Philippines the billing of my service can only take place via a bill from Germany. If you agree to that I can work for you. Just now not availible, I am in Germany. Metro Manila Philippines, Germany, Berlin, Munich, Stuttgart, Switzerland: Zürich Basel Bern House Inspector, Building expert, House Inspector Chartered Surveyor, Appraiser on skype “K.- Dieter Schmalfuss” your Mr. Schmalfuß, civil engineer, structural engineer since 1980, Independent Chartered Building Surveyor since 1993. Home Inspection homeowners can perform a basic walk through home inspection on their own. My House inspection checklist is not intended to be a substitute for a professional home inspection -check from engineer. Home inspection costs about 700€ in Munich, real-estate-due-diligence. Friends working in New Zealand as Civil engineers or building surveyors. In other countries: Choosing a Home Inspector and interesting Total Home Inspection Checklist. As discussed today on the phone we plan to buy an old house with property in Cebu. According to the Real Estate company the house can be used but needs to be rennovated. 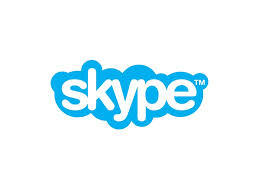 We are not sure how long we will to be able to use it and want to know if there are any major issues. Therefore, I searched the internet and also got feedback from some people that you are experts in this matter. Could you please check my request and provide us with feedback: What can be covered under your expert service and how much will it cost? Also please let me know your convenient time for this activity so that I can plan accordingly incl. appointment with Real Estate Company / tenant who is living in the house at the moment. As we talked on the phone this morning, we want to have property evaluation, Residential Property inspection with Mr.Schmalfuß early next week possibly. I asked the seller for a possible appointment already and of course we would need to adjust our appointment for best time for everyone. Please let us know when you are able to visit the apartment, the approximate costs and how long it would take to get the result. Please excuse me writing to you in English. My German is not good enought to explain everything. My partner and I are interested in buying a farm house together with some land. house has approx. 154 m² of living space inside. Plus there is approx. 3,700m² of land around the property with some associated farm buildings. The initial asking price of the property is in the region of euro 289,000. We understand that there could be up to 10% extra to pay for broker commission, notary fees and tax. surveyor to protect ourselves from investing incorrectly. After doing a little research we understand it would be prudent to have a full structural survey done on the property. We understand that this would be in the region of 1% of the purchase price plus 19% tax to produce a written report. reveals that the project is unsafe then we would not continue with the full structural survey. For this initial inspection which could be seen as the first part of the Full Structural Survey we would be willing to offer a price of around 300 $ plus tax. >> Damage and problems etc…..
You can find basic information on the apartment in the attached document. P.S. We are also thinking about Warranty Inspection ore checking house building condo quality in 4 years. I will contract an expert like you if I purchase the house we just spoke about on the phone. The problem is that we are still too far from the initial price and we won’t get to an agreement. 150.000€ to 250. 000$ renovation depending if you transform the swimming pool to rooms. We can do that later of course. Our budget is 750.000€ aprox. so I can’t offer more than 600.000$. Therefore, I don’t think we will get to an agreement unfortunately. 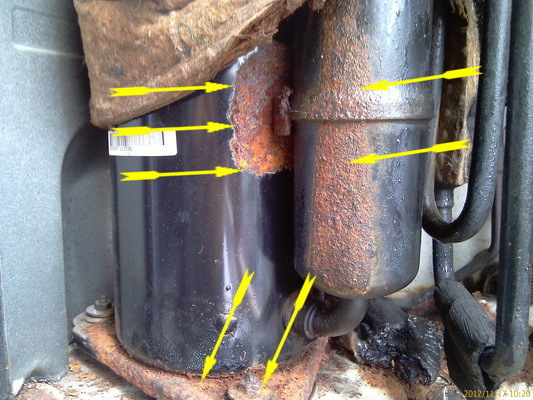 “…We bought 2 apartments In various reports of infestation was found skipjack dry rot. 1) What has been done so far and in what quality? What could come at a cost to us? Buy recommendation? 3) assessment of what could still get to work on the house for us based on the existing report? The short report was the basis for our decision to purchase very helpful. With expertise and experience all relevant defects have been compiled. Best wishes also from the new friends from Chicago BR and thanks for Residential Property inspection! I am seeking a gutachter wohnungsabnahme ( Residential Property Inspections) for the handover inspection of our two apartments which are in the final stages of construction now. We have our inspection visit in May and would like to have a professional surveyor participate. It is necessary to speak English. Can you please let me know if that is possible and what would be the cost. The two apartments are in the same building and are each less than 45 square meters, so can be easily combined into one appointment.